In the late 19th century, Dr. Morgan Dix was one of America's most active and respected churchmen. 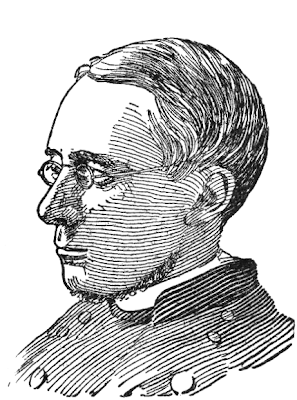 For over fifty years, he was associated with New York's Trinity Church, first as minister, and then as rector. He also wrote a number of religious works. He was a genuinely godly man: kindly and tolerant, if somewhat on the stodgy side. What makes this otherwise uncontroversial man of God relevant to this blog is that he was also once the victim of a bizarre and long-drawn-out hoax that was a considerably more sinister variation of the famous "Berner Street Hoax" of 1810. Rev. Dix's ordeal began on the morning of February 18,1880, when he answered a doorbell ring at his rectory. Standing outside was a respectable-looking man in clerical garb, who presented himself as a head of an academy for young ladies. He was there in response to Dix's letter asking them to take three little girls into their establishment. Dix politely explained that there was some strange mistake: He had never sent such a letter, and for the matter of that, did not even know three girls who needed to be placed in a school. The man went on his way. Dix brooded over the matter for a moment, shrugged it off, and returned to his breakfast. It was a breakfast he was fated to leave unfinished. In fact, he would not have a peaceful meal again for quite some time. Scarcely had he sat down again when another representative from another girls' school arrived. He had gotten a similar letter, purportedly from Rev. Dix. By the time the day was over, about 20 such gentlemen had turned up on Dix's door. That is, they turned up when Dix's front door wasn't being besieged by emissaries from Bible societies, publishing houses, and merchants of all varieties. Each and every one of them was clutching letters signed with Dix's name, saying he wished to make large purchases from them for various charitable organizations. Then came the safe manufacturers, wig makers, horse dealers, dancing instructors...all of them also believing that the reverend had requested their services. To Dix's increasing horror, on the following day he was confronted by a similar parade of callers, augmented by a flood of puzzled letters from clergymen across the entire East Coast, responding to notes they had received from "Dix," chiding them for not answering his letters to them--letters, of course, which Dix had never written. Some of these letters, we are told, not-so-tactfully suggested that Dix had been working too hard and needed a good long rest. On February 21, Dix received an unsigned letter informing him that the writer had arranged for some dealers in used clothing to come by that day to pick up Mrs. Dix's entire wardrobe. Sure enough, soon after reading this letter Dix saw a parade of these merchants driving their wagons up to his house, loudly demanding the clothing they had been promised. Dix barricaded himself inside his home, but the dealers, increasingly angry at how--in their eyes--the rector was trying to swindle them, caused such a riot outside that the police had to be called in to drive them away. No sooner had these outraged clothiers departed than a carriage came racing up to the rectory. It stopped, and a doctor leaped out and ran inside the house. He was quite indignant when he learned that, contrary to what an urgent message had told him, the reverend was not dying of an epileptic fit. He was soon joined by about thirty other physicians, all of whom had received that same frantic plea for medical help. It was not until midnight that Dix was finally rid of the lot of them. Perhaps at least some of these doctors should have stuck around a bit. When, bright and early the next morning, Dix was awakened by half-a-dozen shoemakers who had been summoned to measure the rectory's residents for footwear, the reverend probably was close to having fits. That was the reverend's breakfast. Dix spent his lunchtime dealing with fifty or so people answering "help wanted" ads placed in his name. Dinnertime saw him eying twenty of New York's most important clergymen, who had answered "his" invitation to come dine with him in order to meet the Bishops of York and Exeter. The following morning was enlivened by visits from officials of some of the city's top business houses. They had all received letters signed with Dix's name, threatening legal action because of the insulting communications the reverend had received from them. These emissaries had no idea what this was all about--they had, of course, not sent Dix any letters at all--but they were nevertheless anxious to assure the reverend of their good will. In the meantime, word had spread about the lively doings at the Trinity rectory. Crowds of New Yorkers were now surrounding the reverend's home, happily waiting to see who would show up at his door next. It was a party atmosphere for everyone except the Dix family. It was not until the end of that day that the understandably befuddled reverend got any clue about how and why his life had been turned into a nightmarish vaudeville skit. He received a letter from someone who gave his name only as "Gentleman Joe." "Joe" cheerfully informed Dix that this persecution would only end when the rector had paid him one thousand dollars. If Dix agreed, he was to place an ad in the "New York Herald" saying "Gentleman Joe: All right." Dix naturally took this letter straight to the police. After scratching their heads a bit--even for New York City, this was a novel bit of weirdness--they told the reverend to follow the ungentlemanly Joe's instructions. Dix did so, but was baffled to find that when his ad was published, the newspaper contained two other identical ads, evidently placed by "Joe" himself. By this point, Joe was bored with Reverend Dix. He ignored the rector's ad and instead turned his unwelcome attentions to a crowd of other New York religious leaders, all of whom received abusive letters signed with the names of various saloon-owners, demanding they settle their extensive bills for liquor. Dix was left in an uneasy peace until March 17, when he received another letter from Joe. 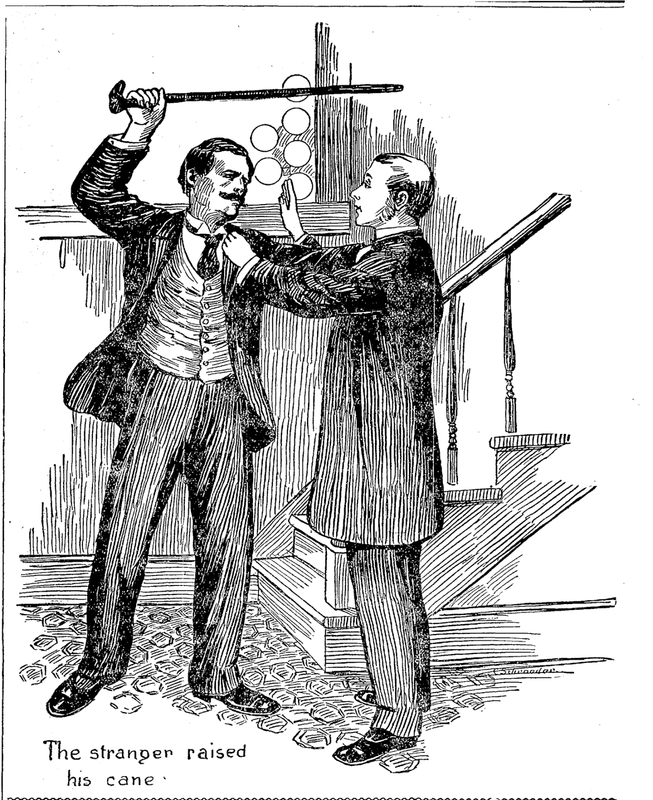 This one warned that unless Dix sent him fifteen hundred dollars, on the following Friday the rectory would see a sequel to the previous adventure. When Friday rolled around, police surrounded the house and Dix locked himself in his office, but Joe was too much for them. First, a lawyer arrived at the house. He had received a letter supposedly signed by Mrs. Dix, stating that she wanted a divorce. Twenty other attorneys, who had all received identical letters, soon followed. Then came an agent from a steamship line with the tickets to Havana Dix had allegedly ordered. They were closely followed by a crowd of people who had advertised for lost or stolen property. They had received letters informing them that their goods could be retrieved at the rectory. Over the next few days, the stream of people continued, all of them answering various summonses. The dramatic climax came when an angry man pushed his way into the rectory, accused Dix of trying to seduce his wife, and threatened him with a beating unless the reverend made a public apology for his disgraceful conduct. The day after his encounter with the enraged husband, Dix received another letter from Joe, gleefully saying how much he had enjoyed his visit with the reverend. The police were not having much luck tracking down Dix's persecutor. They had never heard of any criminal called "Gentleman Joe," and although they set up a dragnet across the city in the hopes of capturing him at some mailbox or another, their efforts were futile. What finally broke the case was when another clergyman told them of a former Trinity Sunday-school teacher who had been expelled from the church. (He had taken a disquieting interest in the choir boys.) This ex-churchman had the appropriately melodramatic name of Eugene Edward Fairfax Williamson. The police obtained from the Post Office a card written by Williamson, requesting that his mail be forwarded to the Hotel Windsor. The handwriting was identical to the "Gentleman Joe" letters. Detectives rushed to the Windsor, only to learn that their deranged bird had flown to Baltimore. He was traced to a boarding house in that city, where he was arrested. Newspapers described him as a small, balding, sickly-looking man of about forty. Williamson readily admitted his culpability, explaining breezily that he had nothing against the Reverend Dix--it was "just a joke"--and the rector was only chosen as a target because his upstanding reputation made the prank all the sweeter. "I really do not know why I did it," he sighed to a reporter from the "New York Sun." "I have a soft spot in that direction. It's a mania. When I get a pen in my hand I have to write." The rest of the tale is briefly told: Williamson was tried for attempted blackmail and forging a check which he had used to swindle a jewelry firm, found guilty, and imprisoned in Sing Sing, where he died only a few months into his three-and-a-half year sentence. There was still a lingering mystery about this odd miscreant. He first appeared in the historical record in 1868, when he traveled through Europe presenting himself as an aristocratic man of wealth. He came to New York in 1870, where he was caught stealing some pens and stationery from a shop. He then returned to Europe, where he served a brief term in London's Newgate for harassing a man in much the same way he would later bedevil Dr. Dix. He returned to America in 1875, where he briefly settled in Pittsburgh before returning to New York and his famed good times with the rector of Trinity. That was about all we know for certain about him. Williamson's source of income also remained unknown. He owned no property, and had no bank account. Although he apparently never worked a legitimate job--unless you count his ill-fated stint as a Sunday school teacher--and never committed more than a handful of petty crimes, he always seemed to have lots of money, and usually moved in high society. His little swindles were evidently something he did merely for his own warped amusement, not financial gain. He even published poetry and produced a successful play--although his literary glory was considerably dimmed when it was discovered that these works were actually written and previously published by a New Orleans nun. Williamson himself claimed to be connected to the wealthy and powerful Fairfax clan of Virginia, and that during the Civil War he fought ably for the Confederacy. This has led to speculation that he was a "remittance man": the black sheep of a prominent family who paid him off to leave his country for his country's good. A sort of Bertie Wooster from Hell, you might say. According to some contemporary newspapers, the truth about him was more prosaic. These reports claimed he was from a well-to-do and respectable Baltimore family, who regarded him as "always flighty." His sister, Mrs. G.F. Bailey, thought vaguely that Eugene had made money some years before "in the book business." She said that she did not know the exact nature of this "book business," as he was "very reticent on such matters." His mother was quoted as saying that her son "was not sound mentally, but was so eccentric that he frequently seemed demented." For someone who made himself famous through his "jokes," Mr. Williamson's story turned out to be not very funny at all. To add a bit to the mystery of Eugene. When he was in London in 1873 he harassed a man named Adolph Rosenbaum, a diamond merchant, so it wasn't just priests he was after. He was caught because he rented a room next door to Rosenbaum and came to the window often to gloat at the stream of visitors. This attracted the attention of a policeman named Keeley. It turned out from Rosenbaum's own testimony that Eugene had lodged with Rosenbaum some nine years before the offence -- that takes us back to the Civil War, so maybe his service record in the Confederacy was fantasy. He was found to have large amounts of money with him and when he sought bail he put up £500 (about $2000) of his own. Interestingly too a Member of Parliament also stumped up £250. I've read a bit about the Rosenbaum episode, but I wasn't aware of the detail of the MP helping with his bail. That's a particularly curious twist. I definitely got the impression that if we could only know more about Eugene, a whole lot of odd things would come tumbling out. Ah. So I did. I should probably hire you as a copy-editor. Great post, thank you. Would you mind sharing your sources? Alice Clement of the Chicago P.D.